It's time to return to our roots. Slippery Elm offers a traditional remedy to cramps and an irritable digestive system. 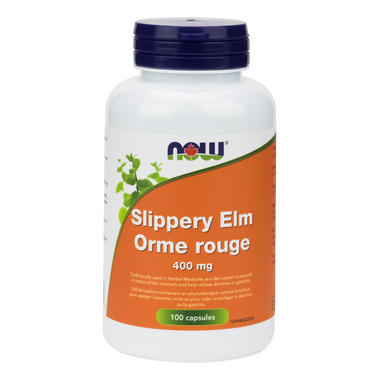 Slippery Elm (Ulmus fulva), also known as Red Elm, Moose Elm or Indian Elm, is a small tree native to North America. It has been a part of traditional herbal medicine for over 100 years, and was used by North Americans and early settlers as a survival food during lean times. Its bark is known for its mucilage constituents, which can help to coat and soothe the tissues of the gastro-intestinal tract. Suggested Usage: As a herbal dietary supplement, take 2 capsules 1-3 times daily. Free Of: Sugar, salt, yeast, wheat, corn, milk, and preservatives. I've been using this for my cat who has CKD. While I can't say for sure, I suspect this has been helping with the increased acid and nausea she gets. I get this as recommended by my dog's vet for his chronic intestinal & irritated throat issues. So sad that there's very little to no choice at all for us Canadians when it comes to plain Slippery Elm. I doubt this product is inner bark. The powder has dark brown specks that suggests it has some outer bark as well. When I mix the powder with hot water, it doesn't become slimy either. It never worked for my dog - both digestion & throat issue. I use this herb in replace of antacid pills. it works great balancing my stomach acids to relieve my heart burn naturally. I highly recommend this product. Great product and a much welcome method in capsule form rather than in powder form the way I used to buy it. Works very well thank you. Excellent product for digestive disorders, such as IBS, peptic ulcers, gastritis, and diverticulitis flare ups. I have all of these ailments and the Now Slippery Elm product is the best natural aid on the market for me. Highly recommend. Slippery Elm is great for pets too. I take it with every meal as well as my 2 dogs. Sooths the stomach and bowels. This Now product works well for soothing inflammed stomach. Would definitely buy again. A friend recommended this for heartburn, while it wasn't 100% gone, it was better, manageable - didn't need any antacids. I take 2 in the morning, one about an hour before supper. I still have to be careful what I eat, but as someone who has had mild to moderate heartburn everyday for 10+ years its better than a prescription or chewable tablets. I have use slippery elm for long time now for stomach ailments,such as ulcers,indigestion and IBS. It great stuff for whatever u tummy troubles maybe.My son recently asked what he could take for his stomach upset/hurting.He took this and 1 pill 3 times day for week or so and his belly got better.